theOutnet.com Herve Leger is ON! Shop from both womens shoes/bags and apparel and NM will double your giftcard. Sale items don't qualify towards the total, but in the past I've gotten a pair of shoes + a pair of undies and it's worked :) Use code "NOVGC". Ends Tuesday, Nov 2. 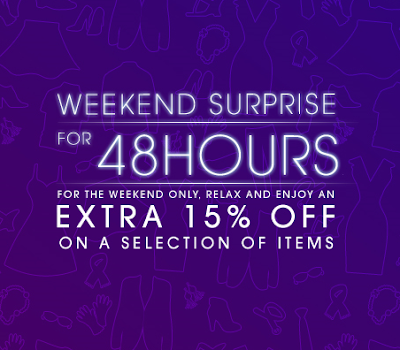 YOOX.com has another selection of items for 15% off this weekend. If you're a fan of American Express ZYNC on Facebook, you can use code "ZYNCCREDIT" to get a little one-time $20 bonus credit on any shopping done in Refinery29's LuckyShops. Ends tonight at midnight! Saks has bulked up its sale section. Because I was recently accepted into the Ella Moss and Splendid online advertising programs, they have gifted me (well, all of us) with a selection of 40% off items. Good for today (Oct 27) and tomorrow (Oct 28), enjoy up to 40% off a selection of Ella Moss items and/or up to 40% off a selection of Splendid items! ShopBop has done additional discounting on Fall-Winter items. Up to 70% off. If you need a coat, you might want to take a peek. The YSL sale will probably be mass mayhem like last year, but if you have a little one to keep stylish, getting two birds with one stone might just make it worth the trip. If you want a bag, you're going to have to be one of the first people in line because last year there was a *lot* of bag-hogging and all-out violence. If you do grab one, make sure to check for damages as I've heard stories of them being retail returns/irregulars/damages. And for the more zen floor, go upstairs. 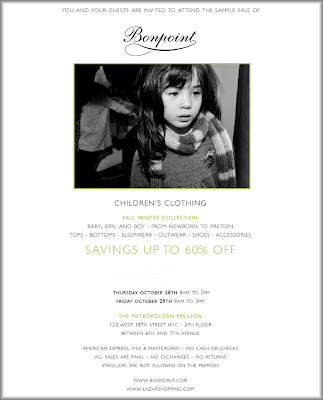 Up to 60% off boys' and girls' clothing, ranging from newborns to pre-teens. I'm thinking baby gifts! CC only (Amex, Visa, MC). No cash or checks. All sales final. No exchanges or returns. Ending tomorrow night, Neiman Marcus is taking an extra 30% off all online clearance. Use code "ADD15" to take an additional 15% off all the sale stuff for boys and girls! Ends Monday, Oct 25. TheOutnet.com is taking 30% off a selection of cute jackets for this weekend's Shop-In. So you want a Valextra bag or some over-the-knee Louboutin boots, but there's no way to get it discounted. Well now's the time to check out Barney's. During their purple card event, spend $250+, $500+, $750+, and get a gift card for $25, $50, $75, and so on! So spend $2000 on a bag and get $200 in a gift card. Not bad, right? Online and in-stores only at all Barney's locations except Dallas (sorry, Dallas). Ends Sunday, Oct 24. YOOX.com has a selection of fall-winter merchandise that's 15% off this weekend. It's a really robust selection-- including tons of coats. You'd think being a V.I.B. would get me notified that their freaking F&F has started. (Really, is it not enough that I drop about $500 there a year?) Anyways, although I'm miffed, there's still a lot of good stuff available (i.e. the shelves have not been cleaned out yet!). Many thanks my fabulous friend Kelly for alerting me!! Thanks to a commenter who tipped me off-- I went searching in my spam box immediately! A limited number of items that qualify, but buying 1 gets you 20% off, 2 gets you 25% off, and 3 gets you 30% off!! Ends Sunday, Oct 24. Now through Tuesday, Oct 26th, if you buy one pair of shoes from Intermix (either in-stores or online), you get 15% off, buy two pairs and get 20% off, buy three pairs and get 30% off! Use code "SHOESALE". No brand exclusions (I think). YOOX.com sample sale ends today. Price points for certain designer items are still a bit high, but I'm looking to get some pants for $29-49 each! Anyway, use code "LASTCHANCE" to take +15% off the sale stuff. It's live: theOutnet.com's Herve Leger sale is up now! You'd think that being one of their World MasterCard holders would entitle me to a little heads up, but no. So I guess I'll just have to jump right in and fight for my goodies like everyone else! 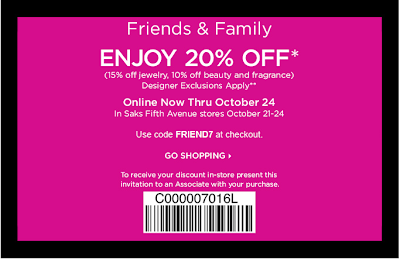 Saks' F&F started online today, but only starts in-stores on Thursday, Oct 21. 20% off clothes, shoes, and accessories* (note the major, bold-faced asterisk and see the exclusion list below), 15% off jewelry, and 10% off beauty. Use code "FRIEND7" to shop online or print out the email to shop in-stores. Good god, the exclusion list just gets longer and longer... now it even includes YSL bags and Valentino. 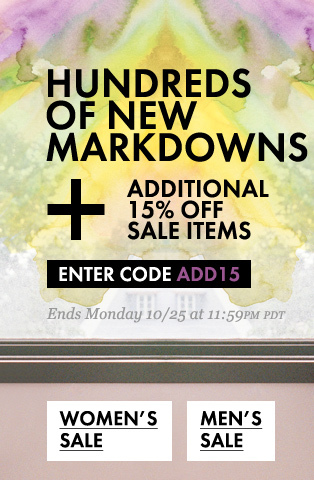 Soon I won't give a toss about this damn sale just b/c there won't be any point!!! Designer Exclusions Include: Akris apparel and handbags, Alexander McQueen apparel, shoes and handbags, Alexander Wang apparel, shoes and handbags, Alexandre Birman shoes, Ann Demeulemeester apparel and shoes, Azzedine Alaia apparel, shoes and handbags, Balenciaga apparel, shoes and handbags, Bottega Veneta handbags and shoes, Brian Atwood, Brian Reyes, Bridal Salon, Bridal Sample Sale, Brioni, Brunello Cucinelli, Buccellati, Bugaboo, Bvlgari, Camilla Skovgaard, Cartier jewelry, watches and sunglasses, Celine shoes and handbags, Chado Ralph Rucci apparel, Chanel, Charbonnel et Walker Café, Charvet, Chloe shoes and handbags, Christian Dior, Christian Louboutin, Christian Siriano, Commes des Garcons apparel, handbags and shoes, David Yurman, Derek Lam, Dolce & Gabbana women's apparel, shoe and handbags, Donna Karan shoes, Doo Ri, Dries Van Noten apparel and shoes, Drop Ship items, Elie Saab, Erdem, Etro, Fendi, Garrard, Giambatista Valli, Givenchy shoes, Graff, Gucci, H. Stern, Haider Ackermann, Hermes, Isaia, J Mendel, Jay Strongwater furniture, Jean Colonna, Jil Sander apparel and shoes, Jimmy Choo, John Allan Men's Grooming Salon, Junya Wantanabae apparel and shoes, Kiton, Lanvin, Loro Piana, Louis Vuitton, MacKenzie Childs furniture, Maison Martin Margiela women's apparel, women's shoes, soft accessories, handbags and jewelry, Manolo Blahnik shoes, Marc Jacobs apparel and shoes, Marchesa Couture, Mario Schwab, Marni, Martin Lawrence Art Gallery special art, Max Mara coats and accessories, Miu Miu, MM6 apparel, shoes and handbags, Moschino, Mont Blanc, Nina Ricci shoes, Nicholas Kirkwood shoes, Notte by Marchesa, Opening Ceremony apparel, Oscar de la Renta apparel, shoes and special orders, Peter Pilotto, Peter Shoiket, Peter Som, Pomelatto, Prada, Prada Sport, Premier Salons (Gift Cards & Products), Proenza Schouler apparel and shoes, Rachel Roy, men's Ralph Lauren Black Label, Ralph Lauren Collection, men's Ralph Lauren Purple Label, Reed Krakoff, Rene Caovilla, Rick Owens Dark Shadow, Rick Owens Lilies, Roger Vivier, Ruggles Grille, Sergio Rossi shoes, Special Delivery to 10022-SHOE, Special Orders, St. John, St Dupont, Thakoon apparel and shoes, The Fur Salon Storage & Alteration Services, Tod's shoes and handbags, Ugg Australia, Under.ligne by Doo Ri apparel, Valentino, Versace handbags, Vionnet, Watch and Jewelry Repair, YSL handbags and shoes, Zegna, Zuhair. Not sure when it expires, but "WANG25" will score you 25% off all Alexander Wang items at BlueBee.com-- even the bags. Oh you silly Kardashian sisters, there's nothing quite like the real thing. You know it, I know it, and everyone who tries on one of your designs and still sees a belly bump is gonna know it. Tomorrow theOutnet.com is having a Herve Leger sale flash sale. Up to 60% off (skirts are around $300! ), and true to their M.O., start time remains a mystery. Disclaimer: I was alerted that you may only get the giftcard if you were on the email distribution. So buyer beware. I don't know if the online chat representatives will be able to give you a clear answer, though. They've never been much use to me in the past. This one is much, much better if you're looking to drop $500+! An awesome return and NO EXCLUSION LIST that I can find!!! Use code "BESTOCT" to get $100,$ 200, or $300 back on your purchase of $500+, $750+, or $1000+! Ends Wednesday, Oct 20. Also use code "NMOCT" to ship for free. The Elie Tahari sample sale is coming back! Last year the prices were phenomenal, and I can't wait to see how it is this year. Prices are 70-80% off for womens clothing, mens clothing, shoes, and bags. I especially want to stock up on work basics - nice sweaters and pencil skirts. I've also always admired the leather bags, which feel soo nice. Very tempting. You'll need to RSVP, but if you get in, there's 70-90% off merchandise waiting for you! 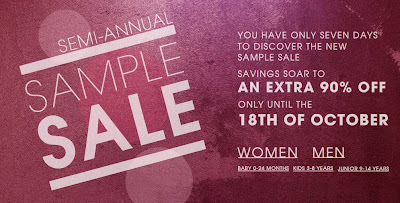 Next week Soiffer-Haskin will be hosting a Max Mara sample sale! I'm particularly excited because this is being billed as fall/winter stuff-- things I could actually use and wear now (what a novel concept). There will be sportswear, coats, and accessories. Discount unknown. TheOutnet.com is doing +50% statement pieces this weekend! 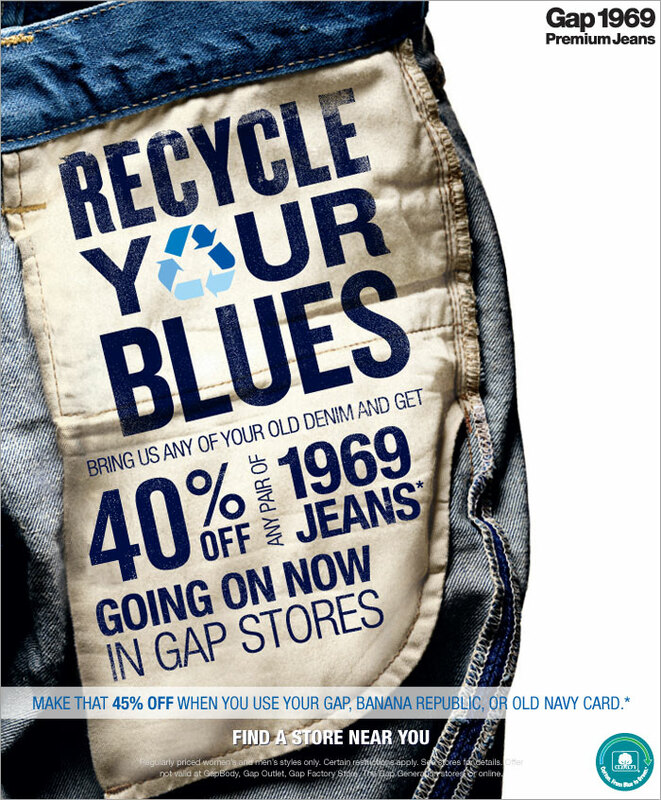 Bring in an old pair of jeans and get 40% off a brand-spankin'-new pair of Gap's premium 1969 line until Wednesday, Oct 20. Kate Spade is having their F&F. Use code "FALLFF10" to take 25% off everything online, or shop in-stores! And, of course brother Jack is running a concurrent promo. Get 25% off everything in-stores or use "FRIENDLYPRICE" at JackSpade.com. Wow, earlier than expected, YOOX.com opens its borders to US residents! Woohoo! Sale ends Tuesday, Oct 20. 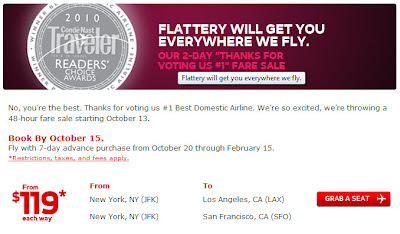 If you have some travel coming up, might want to check the special fares on Virgin America! Special rates must be booked by tomorrow. Of course, there are blackout dates around Thanksgiving, Xmas, and New Year. If you need new jeans, you should probably go here and see what you can find. I've never been (I don't wear Sevens), but I've heard good things about it, like getting jeans for $80. Prices are reduced each additional day, but you must RSVP to get in. (It's free, but it's a nice way to do crowd-control. Another 'spend $X get $Y' giftcard event. Inhabit of cashmere fame is rewarding $200+ purchases through Wednesday, Oct 27 with a little kickback. Spend $200+, $401+, $601+, or $801+ and get a little $20, $50, $100, or $150 something for your troubles. Use code "AUTUMN". 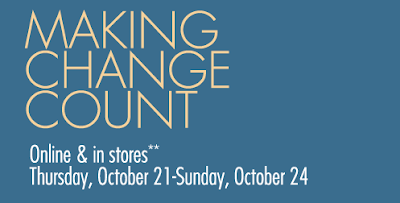 Through Sunday, Oct 24, Piperlime has discounted a HUGE selection of shoes, boots, and bags. I guess us Americans don't get a crack at it until after Europeans, but all the better for you if you live across the pond! Going on now for Europeans-- YOOX.com is having their famous 'sample sale' - their clearing out of all Spring/Summer items at up to 90% off. It's pretty wild. The EU sale ends Monday, Oct 18, and then presumably (I hope!) the US (and by that I really mean me) gets to pounce! Last year I got a Derek Lam dress for $79! Catherine Malandrino boutiques are having a Spend $X get a $Y giftcard event throughout the rest of this month. Starting Friday, spend $250+ at any boutique and get a gift card worth $50, $125, $275 or $600 for the month of November. I'm not sure if online purchases qualify. Wingtip and intricately designed shoes are so in for fall, if that's not just another reason to want a pair of Alaias! The pop-up sale starts tomorrow, although exact time is unknown. The Pratesi sample sale at Soiffer-Haskin started this morning and continues through Tuesday. They'll have bedding, towels, and table linens up to 75% off. Having started Friday, the Tourneau pre-owned sale is rolling through the weekend until Monday. Being a sale of pre-owned watches, I expect all the big guns to be out on display: Rolex, Patek, Piaget, Panerai, etc. 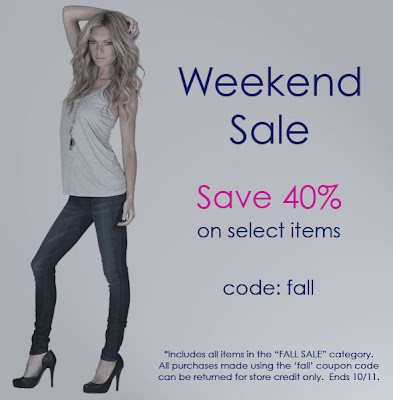 Online boutique IvyBlue is doing an additional 40% off their current sale merchandise. Brands include Haute Hippie, Joie, Halston Heritage, and Elizabeth and James. 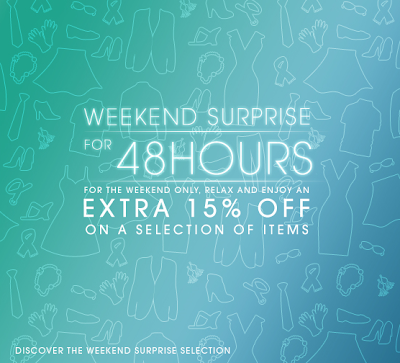 A real winner: theOutnet.com is doing +50% a selection of dresses for this weekend! YOOX, who I believe is gearing up for their sample sale in the background, has put a selection of items at +15% off this weekend. ShopBop's F&F starts today and ends Monday, Oct 11. Use code "INTHEFAMILY" to take 20% off! Tobi.com has jumped into the flash sale game. I just can't keep up with all these anymore!! Going on now: "Indian Summer", which includes tees and tanks from Joie, C&C California, Kain, Patterson Kincaid, Steven Alan. And starting at noon EST today: 60-70% off Seven for All Mankind denim. Men and women! Not to be outdone, Bloomingdale's has marked down select fall merchandise 20-40%. Ends Monday, Oct 11. Nordie's has marked some items down 33%+. Intermix has put their up first round of fall sales. Up to 40% off. Free shipping for $150+ with code "SHIP150". All sales final. Pop into your local BR and check out their sale section-- it's an additional 25% off through Monday, Oct 11. Rachel Rachel Roy is taking an additional 30% off their current sale selection. No code required. Ends Tuesday, Oct. 12. Question for those who know... As I am planning my friend's bachelorette getaway in Puerto Vallarta, I'm scouring the websites looking for swimwear on sale. 1) Because I'm not sure new swim collections will be on the shelves by next March, and 2) because if it's on sale, all the better! Currently the new hotness is Missoni swimwear. There's a nice collection on YOOX.com, and I'm keeping an eye on TheOutnet.com. Personally I have always stuck with Burberry, but I'm intrigued by all the hype. Is it worth it? A Missoni bikini, even on sale, can top $400! HerRoom.com has discounted all Calvin Klein bras by $10, so they are now priced $32-36, which is about the same price you'd pay at Loehmann's, Filene's, TJ Maxx, etc. EXCEPT these haven't been pawed at and/or trampled! Hurrah! Their Clearance section also has a nice selection of Hanky Panky styles with select discounted colors, Splendid tees and tanks that also have some discontinued colors, and a Splendid shawl/cardigan thing that looks super cozy and is now $39.99 (from $77). It'd also make a great Xmas gift. 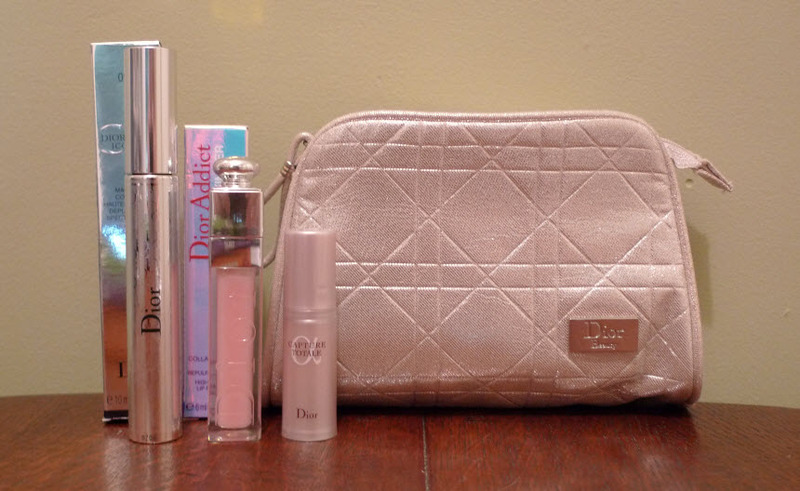 Not sale-shopping related, but I thought I'd mention Dior beauty's very nice kick-back program. The premise? Buy Dior beauty products (skincare, fragrance, make-up) over a 12 month period, save those receipts, and turn them in for a little something. I heard about this program last year, so this is my first DiorDiva Program reward. I'm surprised that as much as people talk about the program, there isn't much mention of what you actually get. The most educational pieces of info are via super annoying 'reveal' videos on YouTube, and there's only so much squealing and bad camera handling that I can stomach. So for those of you who are curious, here is the Runway Diva 500 point gift. It includes: a nice little makeup bag, a full-size Iconic mascara (value $27), a full-size Lip Maximizer (value $29.50), and a deluxe sample of Capture Totale something or other (I'm guessing it's a sample of their serum). Another good thing is, they accept Sephora purchases. Almost all my purchases were online via Sephora, using some discount or another. And even though I bought that eyeshadow with a 10% off code, I got full points value for it (although maybe that's just because Sephora doesn't re-adjust the product prices to reflect the discount-- they do a total discount at the bottom). I probably will never rack up $750 worth of eye makeup and lipsticks, but if you use the skincare, you definitely will want to start saving those receipts! The Dior Beauty website is down for renovation, but you can still download the redemption form from that little link in the small print. Get your Kooba 40-60% off at their sample sale starting today. Remember, it is quite chaotic, but they close from 2-3PM to restock and reorganize. So if you're not an early bird, be there at 3! Sorry, I had a hectic weekend and this slipped off my radar. The annual Loro Piana sample sale is winding down this week, which should mean additional discounting! They have womens and mens cashmere knitwear, clothing, outerwear, and accessories, as well as bolts of wool and cashmere fabric for those talented do-it-yourself-ers. YOOX.com is having a Jil Sander event. Use code "YOOXLOVESJIL" to get 20% off all Jil Sander items + free shipping until Sunday, Oct 3. TheOutnet.com is doing +40% off denim!